Strathwood has broadened its handsome collection of cast-aluminum furniture with the St. Thomas ensemble. 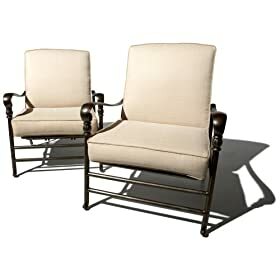 Durable yet surprisingly lightweight, these two deep seating motion chairs add a more upscale look to a porch, deck or patio than wooden furniture, and are easier to move around. Designed to offer a gentle, slight bounce/rock, the chairs provide an easy, relaxing range of motion. Screw-on glides underneath the chairs' legs allow some leeway in adjusting for uneven surfaces. Part of the fully coordinating St. Thomas deep-seating collection, this set of chairs is designed to elegantly pair with other pieces in the collection. Sized for comfort and utility, each chair measures 28 inches wide by 34 inches deep by 34 inches high and weighs 33-1/2 pounds. Adding comfort to each metal chair is a single cushion that folds in the middle to cover the seat and back, and is upholstered in fabric designed for outdoor use. The light beige cover is made of Olefin, which repels water and wipes clean but does not remove for cleaning. A Velcro tab on the top and ties on the seat corners attach the cushion to the chair so it won't slide around or blow off in a strong wind. The cushion measures 48-4/5 inches long by 23-3/5 inches wide. The seat cushion is 5 inches thick and the back is 3 inches thick. The St. Thomas collection also includes a dining table, swiveling dining chairs, a round table with fire pit, side table with ice bucket, a 2-seater loveseat, and chaise lounge. Each piece features the same ornamental scrolling vine motif in a dark-brown finish with bronze highlights and silver flecks. This all-weather, easy-care furniture is made from the highest grade of aluminum. The pieces are sand casted, covered in a powder-coat finish, and designed to be rust-free.